Broken Bow star Dustin Lynch celebrated his first #1 hit as a songwriter on Monday in Nashville. "Good Girl" was written by Lynch, Justin Ebach and Andy Albert, which topped Country radio in January. Lynch's follow-up single, "Ridin' Roads" was the #1 most-added song this week, with 46 stations on board spinning the track nationwide. 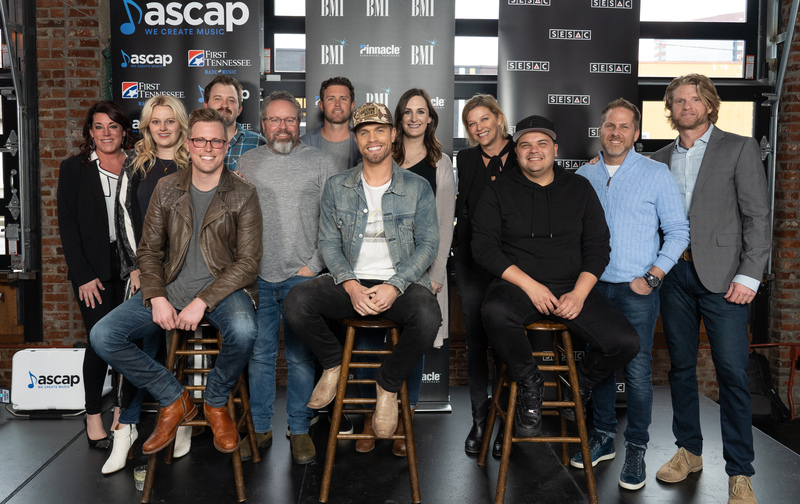 Pictured above celebrating "Good Girl," Front Row (L-R): ASCAP songwriter Andy Albert, BMI songwriter Dustin Lynch, SESAC songwriter Justin Ebach. Back Row (L-R): CURB/WORD's Janine Ebach, ASCAP’s Beth Brinker, BMG’s Jake Gear, Downtown Publishing’s Steve Markland, Warner Chappell's Ryan Beuschel, BMI's Maryann Keen, SESAC’s Shannan Hatch, BBR's Jon Loba and BMG’s Kos Weaver.